The SP Hunters starting line-up for this weekend’s Intrust Super Cup Round 18 clash against Northern Pride remains unchanged despite their eight point’s loss to Redcliffe Dolphins on Sunday. Sailas Gahuna is the only addition to the extended bench in place of William Mone. 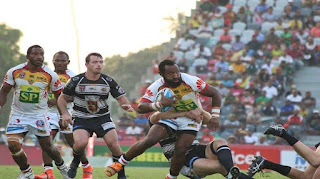 Coach Michael Marum will finalise the 18 man team at the Captains Run on Saturday and the final 17 man run on side will be named an hour before kick off on Sunday. The game against Northern Pride kicks off at 3.00pm this Sunday July 15, 2018 at the Oil Search National Football Stadium in Port Moresby. The earlier game will see the Digicel Cup Round 15 clash between NCDC Port Moresby Vipers and PRK Gulf Isou which kicks off at 12.15pm.